It's Valentine's Day, it's Sunday, and I live with four chocolate-loving females. Oh, and I also wanted to give them a gift that was better than the usual. Given all that, here is what I came up with -- a Valentine's Day Sundae. 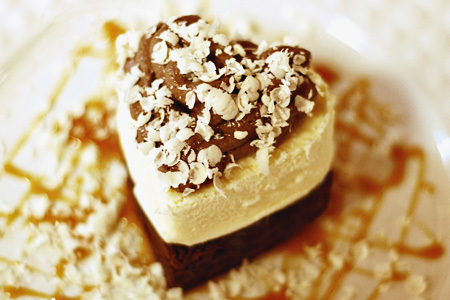 It's a rich heart-shaped brownie with a heart-shaped layer of double-vanilla ice cream, which is then topped with dark chocolate mouse and white chocolate shavings. This isn't a recipe post; I'm just sharing the finished product. Sorry. Be still my chocolate heart! This looks wonderful and so special. Better yet, It doesn't look like it was too terribly hard, either.